We are committed to staging Games in accordance with environmental and sustainable development principles and determined to protect endangered species such as the Persian leopard, which has become a symbol of the Olympic Games of 2014 in Sochi. Persian Leopard cubs are born in Sochi National Park for the first time in 50 years as a result of a program to restore the population of these unique animals. The program has been implemented within the framework of the "Games in Harmony with Nature" dimension of the Sochi 2014 Environmental Strategy. The program aims to contribute to the biodiversity preservation in the region in the lead up to the Sochi 2014 Games. The parents of the "Olympic" cubs are leopards Zadig and Andrea, brought to the Persian Leopard Breeding and Rehabilitation Center in Sochi from Lisbon Zoo in October 2012. Young leopards are currently kept with their mother and will be released into the wild in the Caucasian State Nature Biosphere Reserve after adapting to the wild. Experts will continue to monitor the cubs’ health and development. If the program continues its success in the future, a stable leopard population will be created on the territory of Russia in 10-15 years' time. "The birth of these leopards proves success of the Sochi 2014 Environmental Program. We are committed to staging Games in accordance with environmental and sustainable development principles and determined to protect endangered species such as the Persian leopard, which has become a symbol of the Olympic Games of 2014 in Sochi." The Persian leopard is considered an endangered species and is on the Red List of the International Union for the Conservation of Nature and Natural Resources and in the Red Book of the Russian Federation. Populations have been preserved in Iran, Armenia, Georgia, Azerbaijan, and Turkmenistan. In Russia, Persian leopards in the wild are few and far between. 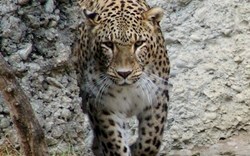 The program to restore the leopard population in the Caucasus is being implemented in the framework of and is an important part of the Sochi 2014 Environmental Program. It unites the efforts of the Ministry of Natural Resources and Environment of the Russian Federation, the Russian World Wildlife Fund for Nature (WWF), the Russian Academy of Sciences and other parties. The Sochi 2014 Environmental Strategy is based on four key areas: "Games in Harmony with Nature", "Climate Neutral Games", "Zero Waste Games", and "Enlightenment Games". The main objective of the Environmental Strategy is to preserve the unique natural surroundings of Sochi, including protected natural complexes of the Sochi National Park (SNP) and the Caucasian State Natural Biosphere Reserve (CSNBR).